Windows is much more exciting when you have two separate monitors so that when you open a new window it doesn't pop up in front of the one you're working on. My computer was originally supplied with a Matrox G550 dual head graphics card but I have only lately realised what it was for. 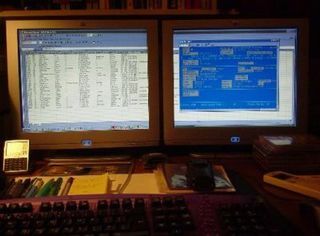 When you've used dual monitors you'll never look back - for instance you can have Microsoft Word on one monitor and File Manager on the other one. Or you can pop up Word in a window on one screen to check an address from Outlook in another. 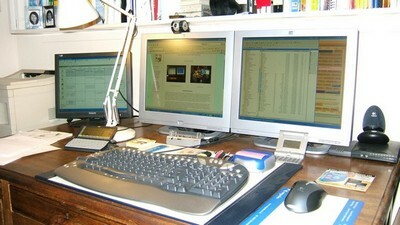 I tend to leave MS Outlook on the right hand monitor while using the left hand screen as my main one. For graphics designers using Adobe Photoshop or Dreamweaver with its multiple operating windows dual monitors are a must. It's not until you've seen it that you realise that this is what brings Windows into its full potential. Large hi-res screens are very nice but separate monitors allow something else to happen without disturbing what you're doing. Kind of putting activities into boxes, and these activities can be "trained" to pop up on the "other" monitor, out of the way but accessible. Multiple monitors work because Windows sees each graphic card as a separate piece of hardware, and in Display Properties>Settings (right click on an empty part of the Desktop) will present a ghost image of each monitor with the opportunity to "extend my desktop" to the new monitor. Most graphics cards have dual monitor capability built in, or you can just add a Windows compatible card for each monitor you want to add. I have just one dual-monitor card, but did try a second card which permitted a third monitor. Mostly just to prove it can be done but it was an interesting experiment.